I originally intended to stuff the masala in brinjals slit into four halves. However, my mom proactively cut the cauliflower florets and had it ready for me to cook. 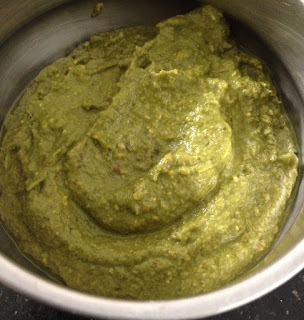 So instead of a stuffing, we used it as a regular fresh ground masala for the vegetable. 1. Wash the florets and soak it water to which salt and turmeric has been added. 2. Clean it well and then drain. 3. Grind the channa dal, red chillies, hing, coriander seeds, and grated coconut. Do not add water. 4. 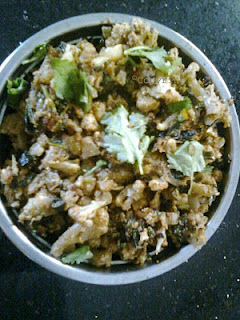 In a tava, heat the oil and splutter jeera seeds, green chillies, hing and add the florets to it. Saute well. 5. Now add the dry masala and mix the florets well. 6. Add turmeric, chilli powder, and salt to taste. 7. Once it is cooked well, remove from the fire and garnish with lime juice and chopped coriander.